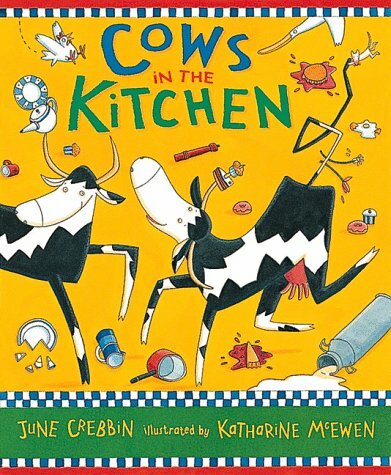 "Cows in the kitchen Moo Moo Moo." What's a farmer to do? Tom Farmer has fallen asleep in the haystack. Well, like they say when the farmer is away the animals shall play! Cows, ducks, pigs, hens, sheep, all invade the farm house in this excellent and repetitive story. Everything from "cows in the kitchen" to "hens in the hat rack". "Cause that's what we do Tom Farmer." The sleepy farmer is finally awoke and shoos the animals from the house. The sleepy farmer again falls fast asleep, but this time in the armchair. The mischievous animals return again and playfully pounce on Tom Farmer. "Cause that's what we do Tom Farmer." This story has no set tune, but has a rhythmic beat in the words which is rounded out by the animal sounds. The story can also be read to the tune of "skip to my Lou". I recommend this books for preschool children ages 3-5.